Divorce Attorney Tucson: Which Situations Qualify for Annulment? An annulment is a legal procedure that exists within both secular and religious systems that declares a marriage null and void, or without validity. It completely and legally erases the marriage as if it never existed. The difference between a divorce and an annulment is that a divorce is the legal termination of a marriage, while an annulment means that the marriage never existed legally. 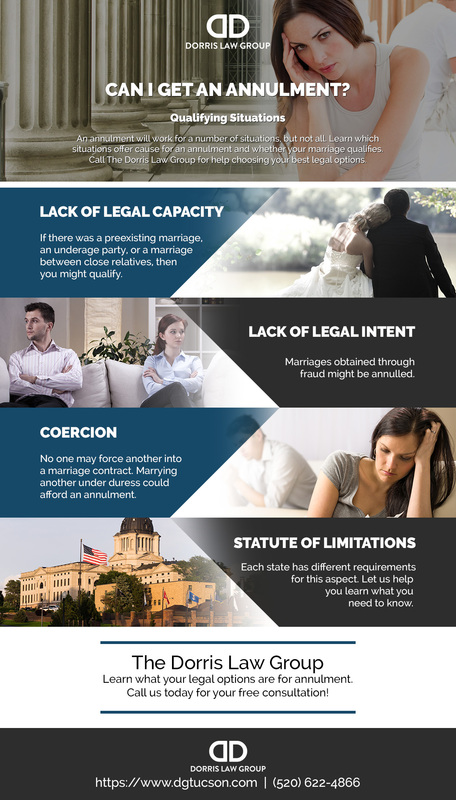 There are several situations which could qualify your marriage for an annulment. Continue reading to learn more and then call The Dorris Law Group for a free consultation with an experienced attorney in Tucson. We’ll discuss the details of your case and help you decide what your best options are. If your spouse did not have the legal capacity to enter into the marriage, it may be possible to get an annulment. There are a number of reasons that could be offered as cause for a lack of legal capacity such as: a preexisting marriage, mental incapacity, one party who is underage, fraud, or consanguinity — a marriage between close relatives. There is also the matter of consent to consider. If both parties do not consent to the union, or if there is evidence of coercion (that one party was forced into the union), then the party who was pressured would have a lack of legal capacity, or cause, for an annulment. This situation addresses instances in which one party might be attempting to marry another while maintaining a false identity. If the other party has no knowledge of their true identity, then a marriage in this type of situation would also qualify for an annulment. Another example of legal intent would be a situation in which both parties conspire together to deceive the government or a corporate entity. For example, marriages that take place simply to help a person achieve citizenship, but are not consummated by physical relations, can also be annulled. In some states, and in certain circumstances, if you are the party in the marriage who was forced to marry under duress, you might be able to pursue an annulment. On the other hand, if you were tricked into marrying someone, and then decided to stay in the marriage after you discovered the truth, you would probably not be able to obtain an annulment. The reason for this is that your actions retroactively approved the marriage. Not all states have the same statute of limitations when it comes to obtaining an annulment. It is important that you check their requirements to learn if you can proceed down that road. If the time frame was 90 days from the wedding ceremony, then you would need to make sure to contact a lawyer within that time frame to begin proceedings. For the state of Arizona to have jurisdiction over your annulment proceeding, either you or your spouse will be required to show proof of residency in Arizona for a minimum of 90 days prior to submitting your appeal for annulment. 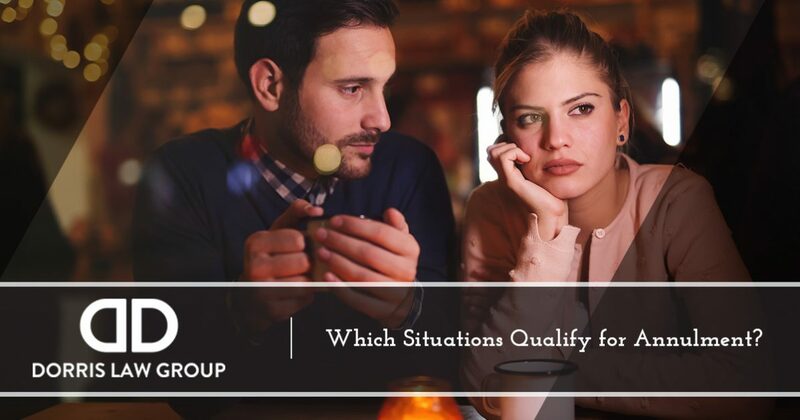 If you are concerned about your marriage and wondering what your legal options are, we invite you to contact Tucson’s Top Rated Local® law firm. We are happy to discuss the details of your case with you to determine what your best choices might be.